If you have ever been stranded on the side of the road with a flat battery, you’ll already know what jump starters are as you probably looked into them. For anyone unfamiliar, let us introduce you to the car jump starter, also sometimes called car battery jump box, jump starter pack or even booster pack. The concept is rather simple no matter what you call it – a temporary connection is made to the battery of another vehicle, or to some other external power source. The external supply of electricity recharges the disabled vehicle’s battery and provides some of the power needed to crank the engine. Once the vehicle has been started, its normal charging system will recharge, so the auxiliary source can be removed. You won’t use it 99 percent of the time, but it will come more than handy when you actually do need to use it. As they say, the best jump box is the one you have when you need it but as most flat batteries happen when you least expect them, for instance, a road trip or when in a rush so when you don’t have one, the only other alternative to the jump start battery is jumper cables. The problem with jumper cables is that you’re left at the mercy of a kind fellow motorist to lend you their battery so you can jump-start your car. That’s not always possible, nor is it fast. A great thing about car jump packs is that most of them are relatively small and don’t occupy a lot of space, so you can carry them around with you all the time. What’s more, most of them have lots of other practical and functional uses and features, but choosing the perfect one can be overwhelming if you’re not too familiar with the subject. Now let’s continue to the detailed 7 best jump starter pack reviews, but before choosing your best booster pack, don’t forget to have a look at the “MUST KNOW” section below. Extras like USB ports and a flashlight are really handy as you can use this booster pack to charge your iPhone or tablet several times. On the downside, this portable jump starter doesn’t come with its own wall outlet charger so needs to be charged from either a 12V car charger or USB. You can find a more-expanded version of the review of the NOCO GB40 here along with a great video showing its capabilities. This portable jump starter packs a ton of power and capacity for repeated jump starts of even bigger engines (4.5 – 6L). It’s a sturdy and well made and the flashlight and two USB ports make it a perfect accessory for almost any car as well for charging your phones whilst camping and one of the best jumps starters on the market. 18000amh combined with up to 600 Peak Amps gives this mini jump starter a lot of power to start gasoline & diesel vehicles. It will jump start 6.5L gas or 5.2L diesel engine up to 20 times on a single charge. It is fitted with LED flashlight with several modes. It is equipped with 2 USB ports – a 2.1A USB Output and a 2.4A smart USB port to quickly charge cell phones, tablets & cameras, and 12V/16V/19V output to charge electronic devices like cellphones, tablets, kindles etc. It also sports a handy display and built-in compass. Used by mechanic professionals and drivers alike, this mini booster pack will start a majority of common vehicles and even small tractors. DBPOWER 18,000Mah multi-functional mini battery booster delivers a great bang for your buck. Powerful, yet small and portable with tons of accessories like laptop charger adapters and 12V/16V/19V output and fitted with smart features for peace of mind make it a great backup for those times when you, your loved ones or fellow drivers need help. Weighing only 1.16 lbs and 6.2 x 1.9 x 2.4 inches it’s one of the lightest and smallest booster packs in the world of jump starters making it a perfect fit for a glove box, the back of a car seat or a backpack which is what you would expect from one of the best jump starters. Capable of jump-starting the likes of 1995 Mercury Cougar 4.6 V8 beast or 5.0 Mustang, it has enough power to start the vast majority of vehicles. This portable jump box also comes with a short cigarette lighter adapter for its 12 Volt 10 amp output which is great to power 12V DC devices like air pumps or tire inflators. It comes with a strobe light, LED flashlight, SOS light and 2 USB ports for charging tablets, phones, laptops, etc., and with various connectors. Included in the package is also an AC charger and a cigarette lighter charging cable. All that is packaged in a small and practical pouch. Equipped with 8 protections for safer use. It’s quite difficult to find something negative about this little jump starter pack. The combination of power, size, usability and price makes it very hard to beat and very easy to recommend. Stanley 1000 Peak Amp Jump Starter packs 500 amps of instant starting power, as well as 1000 peak amps. A built-in safety system sounds an alarm if you accidentally connect the clamps incorrectly so it’s extremely easy and safe to use – you just need to hook the clamps on the starter to the vehicle battery and switch it on. Moreover, it is safe to use because the audible alarm provides immediate reminders about whether you have connected clamps with exact polarity or not. The reverse polarity alarm is loud enough so that wrong connection can be avoided. It has a built-in USB port and the 120-psi compressor. It has enough power to jump-start a car, truck, motorcycle, boat, RV or tractor. Over the years that it has been around it has earned a reputation of a solid jump box for its price which is essentially what it is. Stanley J5C09 is somewhat a legend among jump starters and definitelly worth looking at. It’s definitely on the bulkier side of things so won’t fit in your glove box but if you are after a reliable piece of gear and have the space, this one should be on your list. 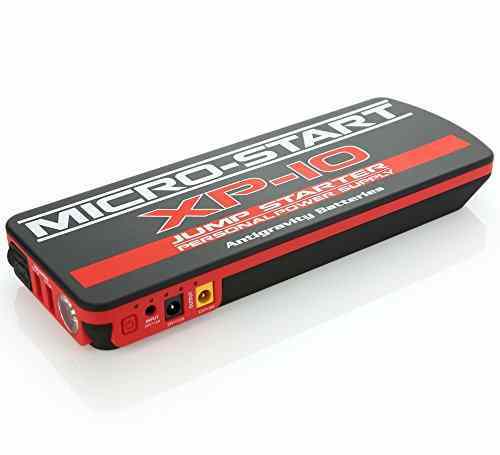 Considering how compact (size of a smartphone and weighing less than 1 lb) yet powerful this lithium jump starter pack is and with its ability to boost most gas-powered vehicles up to 7.0L gas and diesel engines up to 3.5L it surely is one of the best jump starters out there right now. This booster pack comes fitted with 2 USB charging ports (5V/2.1A) for your mobile phone or tablet, dedicated laptop output, built-in multi-mode LED flashlight and spark-proof jumper cables that make it impossible to short circuit in the event that the jumper cables are attached incorrectly. Also, it comes with a soft carrying pouch and 12V car and a wall charger. Due to the small size, it fits the glove box easily. Rugged Geek RG1000 Safety – NEW 1000A Portable Lithium Booster Pack is an impressive unit for its price. Strong yet small enough and well made and backed up by an excellent customer support and a compressor on top of it all, this should be one of the favorites for your glove box. Long story short, for larger engines you need more punch and GB70 is exactly that type of booster pack. Powerful, yet still reasonably sized, this is undoubtedly one of the best jump starters out there. F250s, Kubota tractors, V8 beasts, you name it, it’s capable to start up to 8.0L gas and 6.0L diesels. It is fitted with LED flashlight, a USB port to charge cell phones, tablets & cameras, a 12V output for electronic devices. It also sports Reverse polarity protection which helps you avoid any damage to the car if you connect clamps to the wrong terminals. All that fits in the handy pouch that comes with the jump starter pack. Used by mechanic professionals and drivers alike, this mini booster pack will start a majority of common vehicles and even tractors. 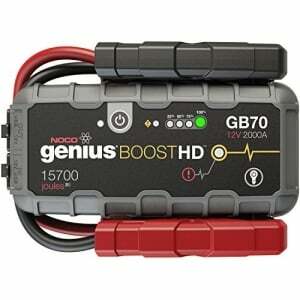 GB70 is a powerful booster pack designed to last and jump start larger engines. Well-designed and built body with durable clamps and smart & safe technology to protect your car. With 18 lbs and dimensions 16.3 x 14.1 x 5.1 inches you know right away that this jump box is on the more professional/heavy duty side of things. It comes with 44″ long #2 AWG cables so it’s easy to reach even more awkwardly placed car batteries and ensures the maximum power delivery. With its capacity, it is a great jump box for tow truck drivers, fleet managers and is able to jump most of the usual vehicles and some (tractors, diesels, etc.). It’s not one that you would carry around much but that’s not what it’s for. 12V output and inbuilt charger complete the pack. 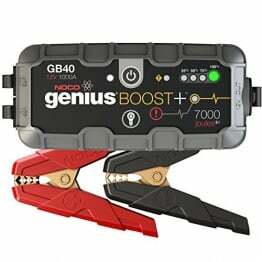 The downside to this car jump starter is that there is no on/off switch, so you must be careful as it always has power and also, due to the inbuilt charger you need an extension lead or C2G / Cables To Go 03115 6ft 18 AWG Outlet Saver Power Extension Cord (NEMA 5-15P to NEMA 5-15R) which is sold separately. And, quite obviously, if you are after a portable or mini car jump starter, this might not the best one. 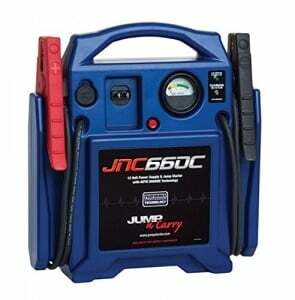 Jump-N-Carry JNC660 jump box is one of the best solutions for those who need that extra bit of power or are after something that will deliver a great amount of power on regular basis. It’s strong but also heavy. If you have enough space, wall socket and an extention lead handy, this is a solid unit to go for. Capable of jump-starting the likes of 5.4 Ford truck or V8 for several times this US-made has been rated best jump starter in consumer reports. Small light-weight lithium portable jump starter pack that fits your hand or glove compartment and maintains most of its charge even after a long period of non-use or charge which is a critical feature for jump boxes as they might have gone for months without a charge when suddenly needed. Due to the size, it’s a perfect backup battery pack for charging phones, tablets, cameras, etc. 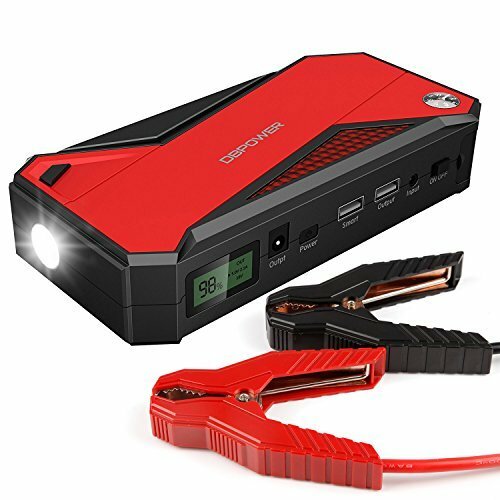 This is a great little and versatile jump starter that fits your glovebox as well as a backpack if you need it on the go. It packs enough power to save you when you need it and those factors make it a serious contender for the best jump starter. And what is the best car jump starter? Only you know because only you know what you expect from a booster pack and in what conditions/how often you expect to use it. Did not find what you were looking for? Check our list of the best portable jump starters! Buying a jump starter can be confusing. When buying a jump starter, you will find that there is very little consistency among jump starter manufacturers in marking the jump boxes. Some manufacturers list in their product specifications just peak amps, some cranking amps, cold cranking amps or just “amps”, some mAh and, quite usually, a combination of those. Some even list joules to confuse you even more. What’s the difference? Which one is a better reference and guidance to buying a jump starter for your ATV, car, truck or snowmobile? Here is a little list of definitions to help you know what is what in the world of jump starter terminology. Peak Amps – generally, peak power ratings are there to impress people. Always refer to the cranking amps and cold cranking amps when comparing jumpstarters. Cranking Amps (CA) – refers to the amount of power that a battery can discharge for 30 seconds at 32° F (0° C). Cold Cranking Amps (CCA) – refers to the number of amps that a battery can push out for 30 seconds at 0° F without dropping under 7.2 Volts. mAh – A milliampere-hour (mAh) is 1000th of an ampere-hour (Ah). Both measures are used to describe the energy charge that a battery will hold and how long a device will run before the battery needs recharging. In general, higher cranking amp ratings are better as this would be the actual power to start your battery. A jump starter with at least a 500 CCA rating should be able to start just about any vehicle with a dead battery. You can find more information in our Peak Amps vs Cranking Amps (and more) post. Most cars have a 12-volt battery, but older, classic vehicles use a 6-volt battery, and so do certain tractors. 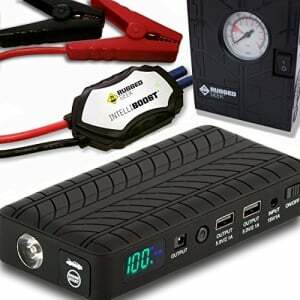 Check your battery’s voltage and buy a jump starter pack matching your battery. As far as the power of the jump box goes, the more the better. The battery needs to have sufficient peak amps, as well as cranking amps to start your car. Most cars require modest power to start, but vehicles equipped with bigger factory batteries such as luxury limos and off-roaders might need a more powerful jump starter. Again, make sure to pay attention to your own car battery and match the cranking amps. Jumpstarting a car with a dead battery can seem like a difficult task if you’ve never done it before but it is not. Follow these 10 easy steps and jumpstart your car like a pro. Besides the alternator, the battery is one of the most vital components in any automobile’s electric system. It provides the juice to run all of your expensive electronic devices when the engine isn’t running, and when the engine is running, it plays a vital role in the proper functioning of the alternator’s voltage regulator. If you want to know more, read our Car Battery Maintenance and Charging post. The winter period is critical for car batteries. Drivers usually start thinking about getting a new battery when the frosts last a long time or are really tough. In a lot of cases, they only decide to change the battery when they are forced to as their car did not start that morning. What most people don’t know is that there are other factors… Read our post Did not start? The frost is most likely not what killed your car battery.